Whether you are in a survival situation or just find yourself faced with a task to perform in the dark, you know that you will be more efficient using both hands. 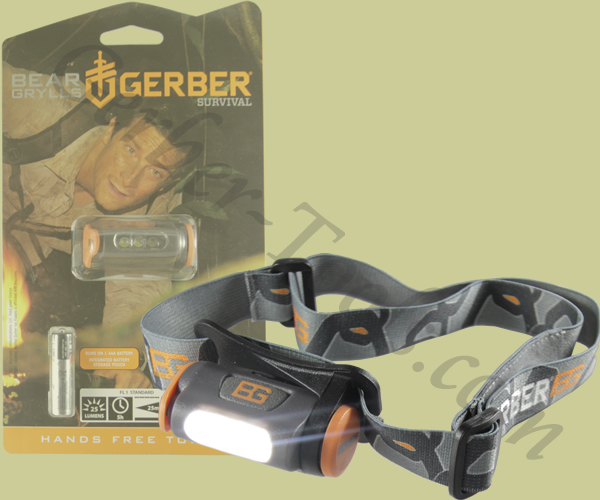 This is where the Gerber Bear Grylls Hands Free Torch 31-001028 proves its worth. It has a clip that you can put this light unto your hat or jacket and then you can use both hands to accomplish your tasks. The compact light operates on a single AAA battery. There are two brightness settings. Low produces 8 lumens and has a 15 hour battery life. High puts out 25 lumens with an 8.5 hour battery life. The adjustable elastic headband has a pouch built into it to store an extra battery. The Bear Grylls Priorities of Survival pocket guide is included.